As you know, some days I struggle for blog posts. But I think I have something where I can milk anywhere from 2-4 posts out of. Maybe not in a row, but still any little bit helps. 710 used to make fun of me (well, maybe past tense is not correct) due to my glasses collection. For a long time, I had about nine pairs of spectacles. It was great when I wore single vision lenses. Now I have about five pair that are bi-focals progressives, and some are woefully out of date....and style. Yet I keep them and for no good reason. I do have one pair of single vision lenses that I just adore. My Ogi frames are just great, though so teeny tiny that no way they could ever be progressive lenses. If I know I am going somewhere that I won't be reading anything I can wear them. And for all 710's ribbing about my glasses, my newest pair are five years old. My last prescription is over three years old. It was time for an upgrade on the script and the hard and soft ware. Yes, glasses and contacts. 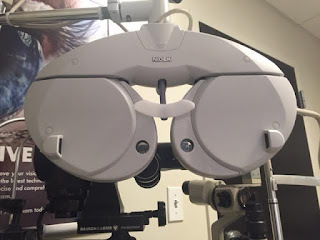 Like last time, I was wow'd by the technology of how they can do eye exams. No more dilation. Barely any more 'number 3 or number 4.......3......or 4....' The doc doesn't even have to twirl those dials - it's all done by touchpad. I kid you not. 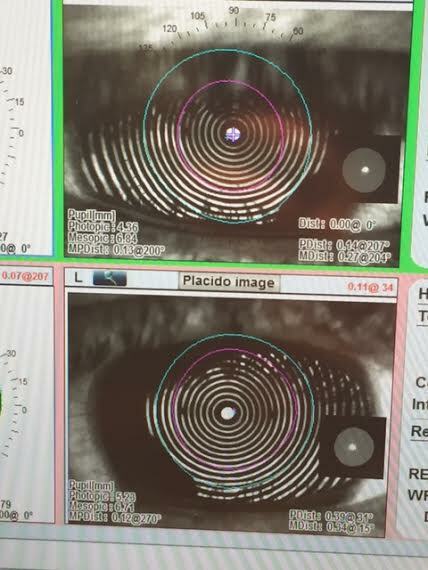 And then you get the scans of your eyes. 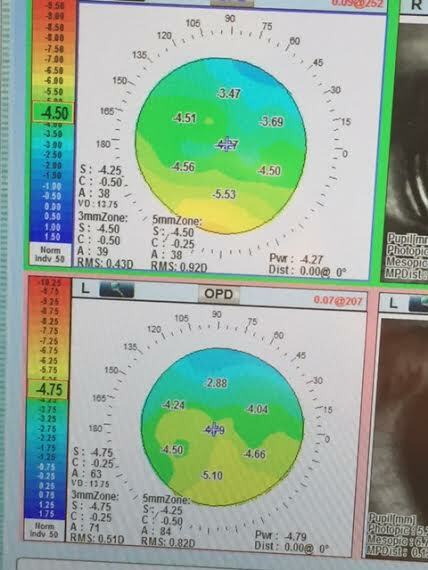 There is also an optic nerve and macula scan. I'm all healthy - no glaucoma, no cmv, no diabetes or macular degeneration. 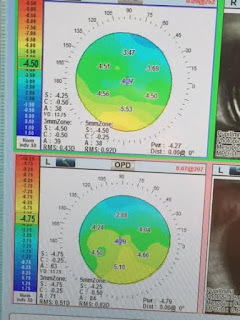 And oddly, little change in my eye sight - like a fraction of a percent for one eye...and 5-6% (which to me isn't so small). Seriously, ringing me up took longer than the eye exam. It was great. I got my contacts in hand before I left the practice and my eyeglass prescription. So this is one post. But instead of going the traditional route of getting glasses made at my normal place, I'm attempting the on-line market. Two different companies. Possibly three. That's right - a blog fashion show of frames. I'm guessing it will be at least Sunday and maybe Tuesday too. We shall see. I feel your pain. I had a too-tiny-for-progressives set of frames for which I paid (then) a lot of money. I hung on to them because I couldn't stand to think of tossing them. Until it hit me: computer glasses. I just had my reading prescription adjusted for the distance between me and my computer screen and, voilà! Single purpose glasses, but at least I get to use them again. I need glasses for driving, but that's it. I hear the best online shop is warby parker. I just got new prescription back in December. Now, 6 months later, I have 4 new pair. When you add up my taste in frames, progressive bifocal lenses, transitions lenses and the non glare/scratch protectant you might as well take out a second mortgage.